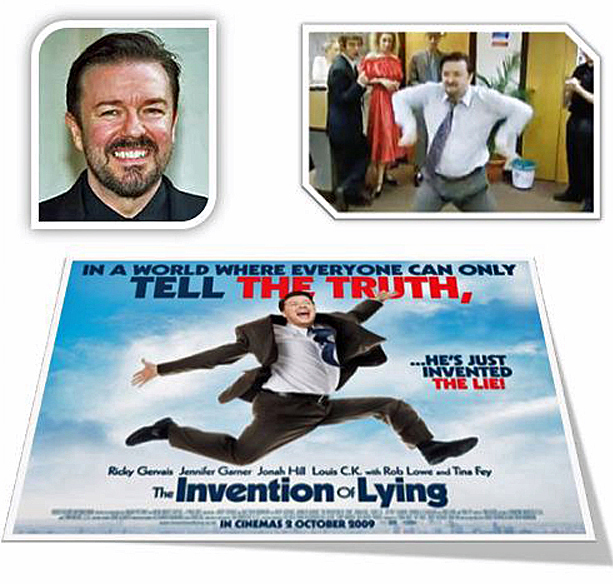 Above: Ricky Gervais; Doing The Office Dance; Publicity poster for Ricky’s 2009 film, The Invention Of Lying. Ricky Gervais’ ancestors in the late 18th century and 19th century originated in deepest rural Dorset, living at the centre of a triangle bounded by the towns of Dorchester, Blandford Forum and Sturminster Newton. 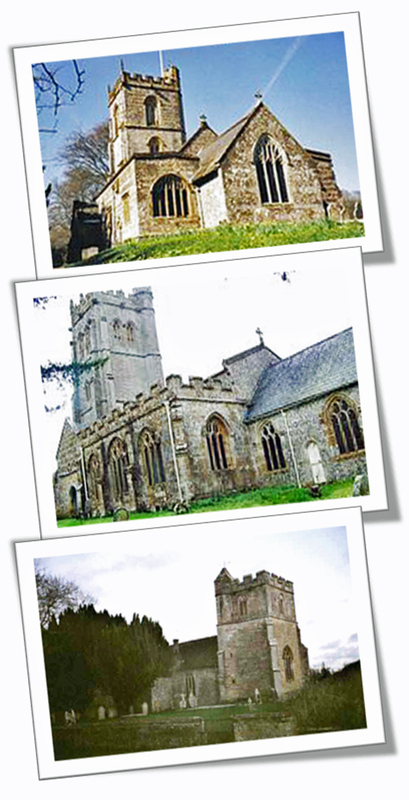 Left: Three ancient Dorset churches that feature in the family tree of Ricky Gervais, where his ancestors were baptised, married and buried. From the top, they are: All Saints, Hilton, All Saints, Piddletrenthide and St Andrew’s, Melcombe Horsey. HE is probably not everybody’s cup of tea, but there’s no denying the enormous success that Ricky Gervais has achieved as a comedian, television actor and film star. His Wikipedia entry describes him thus: “Ricky Dene Gervais is an English comedian, actor, voice actor, director, producer, musician, writer, and former radio presenter.” In other words, what most people would call a man of many parts and talents. Gervais achieved mainstream fame with his television series The Office and the subsequent series Extras, both of which he co-wrote and co-directed with Stephen Merchant. In addition to writing and directing the shows, Gervais played the lead roles of David Brent in The Office and Andy Millman in Extras. Gervais has also starred in Hollywood films Ghost Town, The Invention of Lying and Muppets Most Wanted. He has performed four sell-out stand-up comedy tours and written the best-selling Flanimals book series. Ricky Dene Gervais was born on 25 Jun 1961 in Reading, Berkshire. He was the youngest of four, all his siblings being considerably older than him. He was born 11 years after the next youngest sibling and he has said in interviews that his mother told him he was unplanned. Normally, in this blog I research the direct male line of the subject. 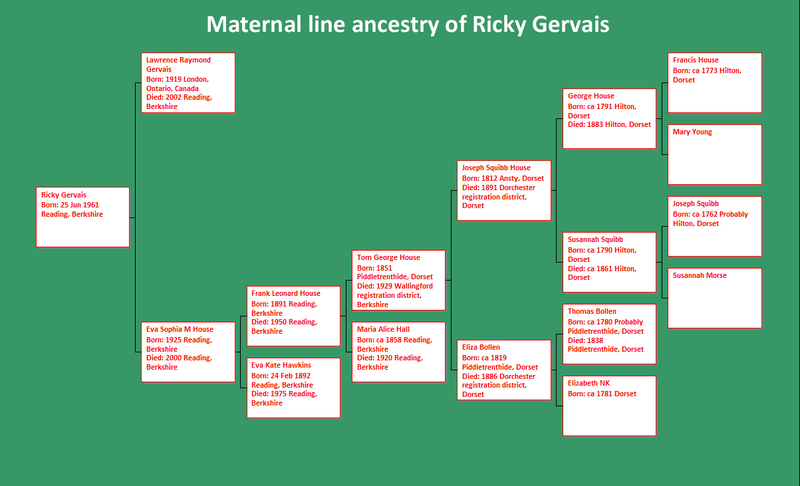 However, in Ricky Gervais’ case this could have proved difficult because his father was a French Canadian who came to England during World War II and, it has been said, met Ricky’s mother during a blackout. However, I never see a problem in researching the maternal ancestral line instead – indeed, it sometimes turns out to be more interesting – and this is what I have done here. Ricky’s mother, Eva Sophia M House, was born at Reading, Berkshire, and married his father there during the war. However, my researches have established that Eva’s ancestors came not from Reading but from deepest rural Dorset. I have got the line back to the late 18th century when they were living in an area roughly at the heart of a triangle bounded by Dorchester, the county town of Dorset, Blandford Forum and Sturminster Newton. Their principal home was the village of Hilton, near Milton Abbas, and they were typical country folk, working as agricultural labourers and woodmen. 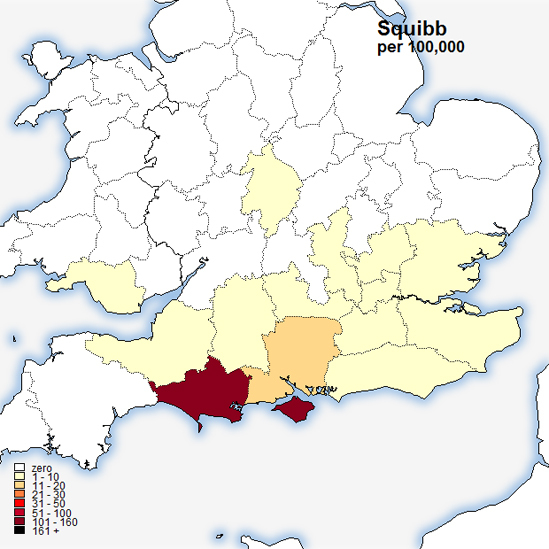 The main family surnames were HOUSE and SQUIBB, both names very prominent in Dorset. Ricky had a great great great grandmother who rejoiced in the rather splendid name of Susannah Squibb! 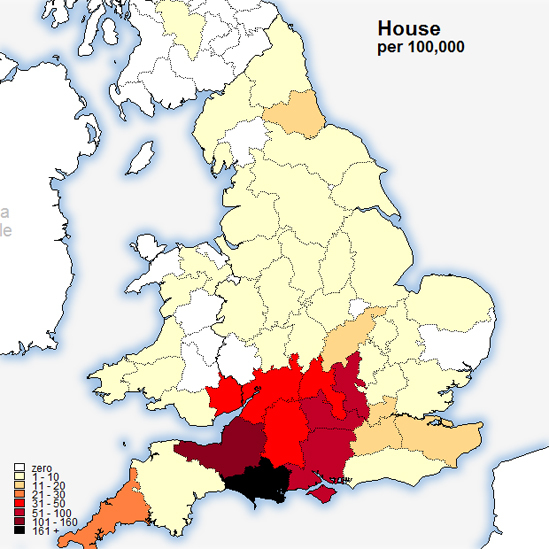 The surnames House and Squibb, both of which figure prominently in the ancestry of Ricky Gervais’ mother, Eva, are strongly associated with the county of Dorset, as these surname distribution maps from the 19th Century British Surname Atlas, produced from data in the 1881 census, reveal. Lawrence Raymond GERVAIS was born in 1919 in London, Ontario, Canada. He apparently was known by the nickname, “Jerry”. He died in 2002 at the age of 83 in Reading, Berkshire. He was a labourer. Eva Sophia M HOUSE and Lawrence Raymond Gervais were married in the July-September quarter of 1944 at Reading, Berkshire.Eva Sophia M House was born in 1925 at Reading, Berkshire. She died from lung cancer in 2000 at the age of 75 at Reading. Frank Leonard HOUSE was born in 1891 at Reading, Berkshire. He died in 1950 at the age of 59 at Reading. He was buried on 20 July 1950 at London Road Cemetery in Reading. In the 1911 census, Frank’s occupation was given as a fitter in a cycle works. Eva Kate HAWKINS and Frank Leonard House were married in the October-December quarter of 1920 at Reading, Berkshire. Eva Kate Hawkins was born on 24 February 1892 in Reading. She died in 1975 at the age of 83 in Reading. Tom George HOUSE was born in 1851 at Piddletrenthide, Dorset. He died in 1929 at the age of 78 in Wallingford registration district, Berkshire. He was buried on 29 May 1929 at the London Road Cemetery in Reading, Berkshire. In the 1911 census, Tom was an Inspector of weights and scales in a biscuit factory at Reading. In an earlier census, that of 1871, Tom was still living with his parents and siblings at Piddletrenthide. He married Maria Alice HALL in the October-December quarter of 1878 at Reading, Berkshire. Therefore, we can date the likely period of his leaving Dorset some time between 1871 and 1878. It seems likely that, in common with many hundreds of thousands of people in Victorian times, he left the rural countryside to find work in a large town. In the censuses of 1881-1901 he was a factory worker in Reading. Maria Alice Hall was born about 1858 in Reading, Berkshire. She died in 1920 at the age of 62 in Reading and was buried on 8 January 1920 at London Road Cemetery, Reading. Joseph Squibb HOUSE was born in 1812 at Ansty, Dorset. He was baptised on 20 December 1812 at All Saints’ Church, Hilton, Dorset. He died in 1891 at the age of 79 in Dorchester registration district. In the censuses of 1851-1881 Joseph was a woodman. Joseph’s middle name of Squibb was seemingly given for his mother, Susannah Squibb. Eliza BOLLEN and Joseph Squibb House were married on 26 August 1840 at All Saints’ Church, Piddletrenthide, Dorset. Eliza Bollen was born about 1819 at Piddletrenthide, Dorset. She was baptised on 21 November 1819 at All Saints’ Church, Piddletrenthide. She died in 1886 at the age of 67 in Dorchester registration district, Dorset. For those unfamiliar with the geography of the UK, the county of Dorset is riddled with place names that some find either quirky or comical and Piddletrenthide is among them. It is a village situated by the side of the River Piddle, which has given its name to a number of places in Dorset – and which some, for reasons of apparent sensitivity, have altered to Puddle. Personally, I prefer the politically incorrect Piddle version! Piddletrenthide gets its name from its position on the River Piddle, combined with it having been assessed for thirty hides in the Domesday Book. Piddletrenthide’s church has a claim to being one of the finest village churches in Dorset, with a splendid 15th-century tower and gruesome gargoyles. 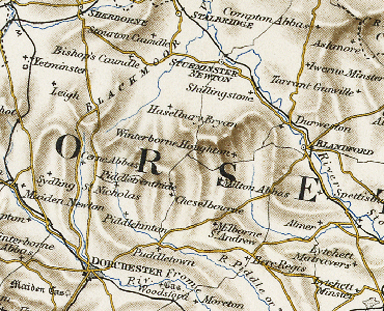 George HOUSE was born circa 1791 in Hilton, Dorset. He died in 1883 at the age of 92 in Hilton, Dorset. He was buried on 2 April 1883 in the graveyard of All Saints’, Hilton. George was an agricultural labourer and woodman. Susannah SQUIBB and George House were married on 15 June 1812 at All Saints’, Hilton..
Susannah Squibb was born circa 1790 in Hilton, Dorset. She was baptised on 31 October 1790 at All Saints’, Hilton. She died in 1861 at the age of 71 and was buried on 26 February 1861 at All Saints’, Hilton. Hilton used to form a part of the estate of the nearby Milton Abbey when it was owned by the wealthy Hambro banking family; consequently the valley here is quite well-wooded due to plantings made to provide cover for pheasants for shooting. The church of All Saints is a typical Dorset country church and is mainly in the late Gothic style. In the north aisle, a fine range of windows from the cloisters of Milton Abbey have been reused. Francis HOUSE was born about 1773 in Hilton, Dorset. He was baptised on 12 Mar 1773 at All Saints’, Hilton. Francis may have been born earlier than 1773, otherwise he would have been only about 16 at the time of his marriage. Mary YOUNG and Francis House were married on 17 June 1789 at St Andrew’s Church, Melcombe Horsey, Dorset. Mary Young’s birth date is not known. Joseph SQUIBB was born circa 1762, probably at Hilton, Dorset. He was baptised on 16 December 1762 at All Saints’, Hilton. Susannah MORSE and Joseph Squibb were married on 12 January 1789 at All Saints’, Hilton. Susannah Morse’s birth date is not known. The splendid Dorset Online Parish Clerks website, http://www.opcdorset.org/, for extracts from Dorset parish registers. The Howes/House & other variants one-name study website http://www.howesfamilies.com/, with thanks to my colleague in the Guild of One-Name Studies, Paul Howes.